Thinking beyond Google and the search for the next big thing in search. rules the roost with a market share of 49.2%, followed by Yahoo at 23.8% with MSN, AOL and Ask ranking up in this order with market shares in single digits. Google recently launched its Personalised Search. This keeps a history of all of one's previous searches, be it in Google images, Froogle, Google video et al. A very useful,feature indeed and interestingly, one can get an idea of his/her preferences/search habits after using this over a period of time. Most of our searches are sporadic and random and it's good to know about our search preferences. Most of our work on the internet begins with a search and the Google's personalised search would give an idea of how do we spend most of our time on the internet. One may also bookmark the pages. So you need not worry if you've searched for something previously and have forgotten to bookmark it. Google's personalised search makes your life easier. One perhaps needs to use it over a period of time to get this kind of data. A small enhancement, but very substantial nonetheless. With Google putting on hold rollout of new products and instead deciding on concentrating its energy on making the existing products work better, it remains to be seen what enhancements it brings to search. Innovation or improvement? Improvement it is, now that Google has reached a stage where it had to stop and think about its future plans, all the hype and hoopla over the GooTube deal not withstanding. The founders of YouTube talk here about the deal. Can't miss the naughty smile on their faces initially and how they break into an almost boyish laughter towadrs the end of the video. Imagine watching a tourist video of Pondicherry and having ads for budget hotels in Pondicherry on the side. That could be GooTube for you! SearchMash. 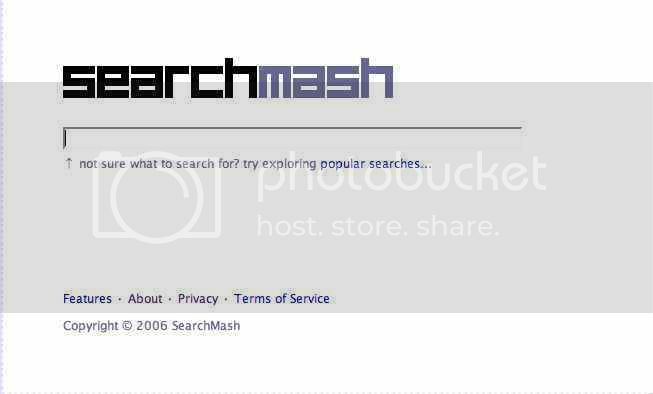 Since Google cannot radically alter search on the main site, SearchMash seems to an ideal playground for experimenting with new ideas. This has a host of new and exciting features, which indeed may lead to making one's own search engine. To begin with, there is no Search button, which is redundant anyway. You hit enter and the SERPs appear with the top three image search results by their side. You may then drag and drop the search results according how important or relevant you think they are. The subesequent search results open in the same page on hitting the spacebar. Very neat - the features, the layout and the idea. Go ahead. Try it! * A smart search engine powered by human intelligence. very thing you are looking for. One may either search the web as you do normally or do a 'live' search. During a live search, you talk to a 'guide' who searches for the information and provides it you. The guides are paid by ChaCha and the remuneration is proportionate to their 'expertise'. You need to be invited to the network- ChaCha Underground and have you work your way up through the guide hierarchy. More details on SearchEngineWatch. 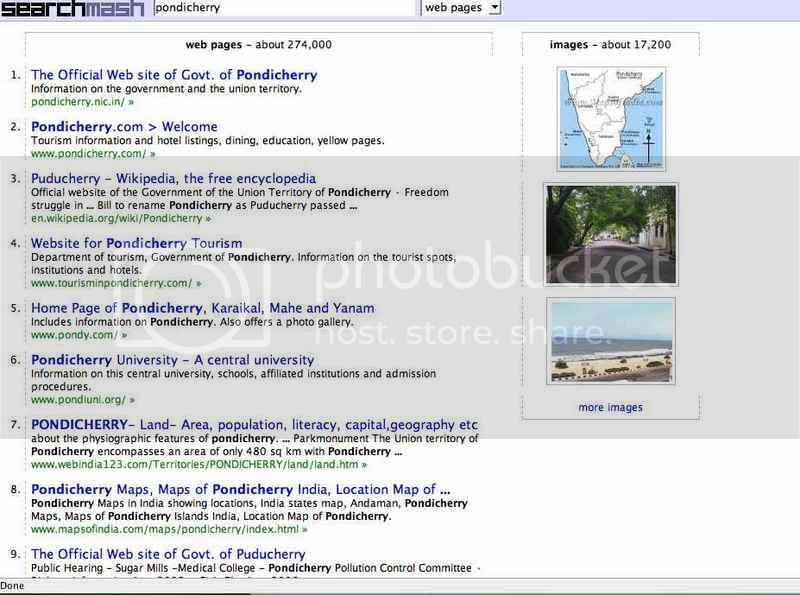 I tried searching for 'Hotels in Pondicherry' with a guide and after I confirmed that that Pondicherry was indeed in South India, I didn't hear anything more from the guide. But still, here's why ChaCha might work. 1. Instead of spending a lot of time searching within hundres of search results, people would be willing to spend that extra time to get exact results for their queries. 2. The human touch, which makes it more interactive and easy to use. Try Clusty. Cluster search arranges the SERPs into cluster thus making it easier for you. Each have these 'clusters' have links within them and thus the search results are arranged according to the category they belong to. Definitely makes searching easier. Clusty come from Vivismo. Also using cluster search results are Mooter and Clush. Clusty, with features like Clusty Clouds, definitely scores here.
" Anyway, we truly were not expecting all this attention yet, as we are not releasing a product in the immediate future. It is a little daunting to have so much attention but not be able show our product yet. Nobody can tell if we are hype or substance (unless they know us). However, from my perspective, one great thing about this blogstorm coming early is that it has kicked off a vibrant discussion about the present and future of search, and what it would mean to be able to express intention to a search engine in a new way. That discussion goes beyond any one company and itself can lead to the kind of transformation every startup hopes to achieve." Personally I believe search is yet to be solved and there's definitely more to search than what Google can offer. So, can Snap provide us with a new search experience. Infact it calls itself - ' the other way to search'. We are all so used to the 'text in text out' way of search that Snap comes as a refreshing change. Refreshing because, though not as 'simple' as Google or the other well-known search engines, it definitely provides a very pleasant search experience. It provides search results on the left and one can navigate through these by using the up/down arrow keys. The previews of the search results appear on the right. Pretty neat for those who aren't conditioned to use keywordese. You may mark the each result as Perfect or Junk thus enabling better results for future searches. The interface is also very user-friendly. According to Snap, here's why they feel they are better. Snap was also mentioned as one of the 50 coolest websites on TIME. My two cents worth on the new movement in search. Nothing can replace Google, because of its deep pockets and its immense popularity. Ther's no denying the huge impact it is having on our lives. But there can definitely be new way out for some kind of searches for which Google definitely doesn't help much. So are websites like Guruji, Raftaar, Onyomo, burrp! the answer?! More on these websites in the posts to follow. Here's the wikipedia list of search engines. 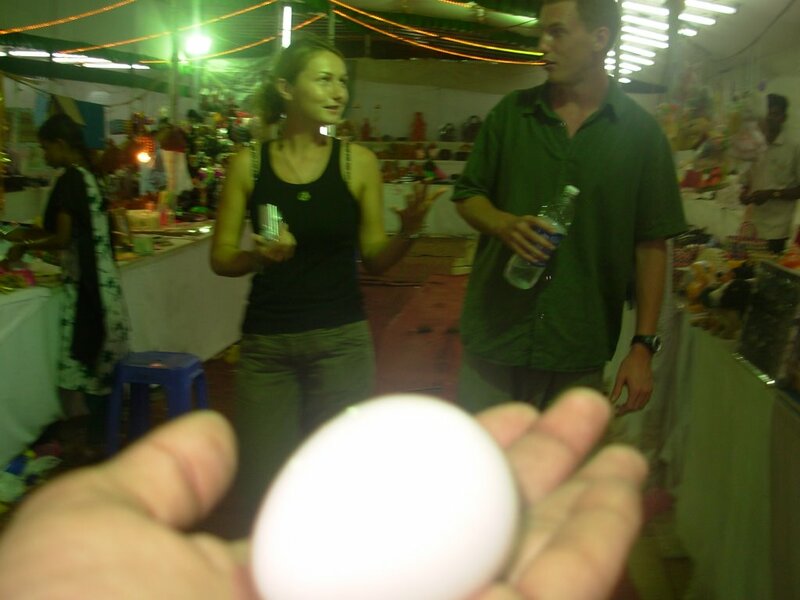 Which came first - the chick or the egg? A little tired and busy with work. Will be back with regular posts soon.